Happy New Year, yarnies! We’re kicking off 2016 with a Free Pattern Friday. 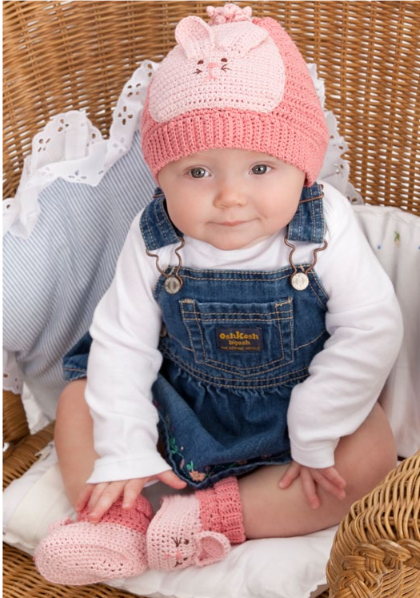 Looking for some free baby crochet patterns? Want to keep your own little one warm this season? Today we have these adorable free crochet patterns from our friends at Red Heart! 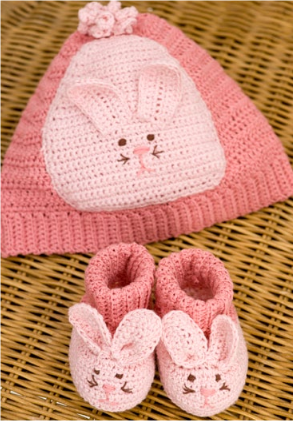 Crochet baby booties are cute enough on their own, but add a matching bunny hat and we’re in baby heaven. Learn how to crochet these bunny baby booties and crochet hat, and you’ll have a blast working them up for all of the youngsters in your life! Hat and Booties fit size 12 months. 2 balls 275 Coral A, 1 ball each 705 Pure Pink B and 365 Twig C.
12 sts = 2”; 6 rows = 2” in dc with double strand of thread. 14 sts = 2”; 12 rows = 2” in sc with double strand of thread. CHECK YOUR GAUGE. Use any size hook to obtain the gauge. dc2tog (worked over 2 sts)= [Yo and draw up a loop in next st, yo and draw through 2 loops] twice, yo and draw through all 3 loops on hook. sc2tog= [draw up a loop in next st] twice, yo and draw through all 3 loops on hook. NOTE: Thread is used double throughout. Begin at bottom edge, with A, ch 9. Row 1: Sc in 2nd ch from hook and in each ch across; turn – 8 sc. Rows 2-106: Ch 1, sc in back loop of each sc across; turn. At end of last row, pivot to work across long edge. Row 1: Ch 1, sc in side of each row across; turn – 106 sc. Row 2: Ch 2, skip first sc, dc in next sc and in each sc across; turn – 106 sts. Rows 3, 5, 7: Ch 2, skip first dc, dc in next dc and in each dc across and in top of ch-2; turn. Row 4: Ch 2, skip first dc, dc in next 7 dc, dc2tog, [dc in next 8 dc, dc2tog] 9 times, dc in next 5 dc and in top of ch-2; turn – 96 sts. Row 6: Ch 2, skip first dc, dc in next 13 dc, dc2tog, [dc in next 14 dc, dc2tog] 5 times; turn – 90 sts. Row 8: Ch 2, skip first dc, dc in next 12 dc, dc2tog, [dc in next 13 dc, dc2tog] 5 times; turn – 84 sts. Row 9: Ch 2, skip first dc, dc in next 11 dc, dc2tog, [dc in next 12 dc, dc2tog] 5 times; turn – 78 sts. Rows 10-18: Continue in same manner, decreasing 6 sts every row and having 1 less st between decreases – 24 sts. Row 19: Ch 1, [sc2tog] 12 times. Fasten off leaving long ends for sewing. Weave threads through remaining sts, draw up firmly, fasten securely. Sew back seam. Row 1: Sc in 2nd ch from hook and in each sc across; turn – 24 sc. Rows 2 and 3: Ch 1, 2 sc in first sc, sc to last sc, 2 sc in last sc; turn – 28 sc. Rows 4-17: Ch 1, sc in each sc across; turn. Row 18: Ch 1, sc in first sc, sc2tog, sc to last 3 sc; sc2tog, sc in last sc; turn – 26 sc. Row 19: Ch 1, sc in each sc across; turn. Row 20: Repeat Row 18 – 24 sc. Rows 21-30: Repeat Rows 19 and 20 – 14 sc. Rows 31 and 32: Repeat Row 18 – 10 sc. Edging Round: With right side facing, ch 1, sc around entire piece; join with a slip st in first sc. Fasten off. Row 1: Sc in 2nd ch from hook and next 7 ch, 3 sc in last ch, working on opposite side of ch work 8 sc; turn – 19 sc. Row 2: Ch 1, sc in first 8 sc, [2 sc in next sc] 3 times, sc in last 8 sc; turn – 22 sc. With B, [ch 8, 3 sc in 2nd ch from hook and each ch across] 10 times. Fasten off. Draw bottom of all curls together and pull tightly to form tail.Embroider satin st eyes with C. Embroider straight st whiskers with C. Embroider satin st nose with Aand straight sts mouth with A. Sew all parts in place on front of hat. Row 1: Sc in 2nd ch from hook and in each ch across; turn – 18 sc. Rows 2-36: Ch 1, sc in back loop of each sc across; turn. At end of last row, pivot to work across long edge. Row 1: Ch 1, sc in side of each row across; turn – 36 sc. Row 2: Ch 2 (counts as dc), skip first sc, dc in next 14 sc, [2 dc in next sc] 6 times,dc in next 15 sc – 42 sts. Fasten off. Row 3: Join Bwith sc in first dc, sc in next 15 dc, hdc in next 2 dc, [2 dc in next dc] 6 times, hdc in next 2 dc, sc in next 15 dc, sc in top of ch-2; turn – 48 sts. Row 4: Ch 1, sc in first st, 2 sc in next st, sc in next 15 sts, 2 hdc in next st, 2 dc in next st, [2 dc in next st, dc in next st] 5 times, 2 dc in next st, 2 hdc in next st, sc in next 15 sts, 2 sc in next st, sc in last st; turn – 59 sts. Rows 5-11: Ch 1, sc in each st across; turn. At end of Row 11, join to first sc of row with a slip st to begin working in rounds. Rounds are worked continuously without joining. Place marker in first st of round and move up each round. Round 12: Sc in back loops of each sc around. Round 13: Working in both loops, [sc2tog] 3 times, sc in next 17 sc, [sc2tog] 3 times, sc in next sc, [sc2tog] 3 times, sc in next 17 sc, [sc2tog] 3 times – 47 sc. Round 15: [Sc2tog] 3 times, sc in next 11 sc, [sc2tog] 3 times, sc in next sc, [sc2tog] 3 times, sc in next 11 sc, [sc2tog] 3 times – 35 sc. Round 17: [Sc2tog] 3 times, sc in next 5 sc, [sc2tog] 3 times, sc in next sc, [sc2tog] 3 times, sc in next 5 sc, [sc2tog] 3 times – 23 sc. Round 18: Sc in each sc around. Fasten off leaving long ends for sewing. Sew sole seam lengthwise. Sew back seam. Join Bin any free loop of Row 11; ch 1, sc in each free loop around; join. Fasten off. Row 1: Sc in 2nd ch from hook and in next 4 ch, 3 sc in last ch, working on opposite side of ch work 5 sc; turn – 13 sc. Row 2: Ch 1, sc in first 5 sc, [2 sc in next sc] 3 times, sc in last 5 sc; turn – 16 sc. Row 3: Ch 1, sc in first 3 sc, hdc in next 3 sc, [2 dc in next sc] 4 times, hdc in next 3 sc, sc in last 3 sc – 20 sc. Fasten off. Sew in place at front of bootie. Embroider C satin st eyes and straight st whiskers. Embroider A satin st nose and straight sts mouth. What’s your favorite thing to crochet for baby? 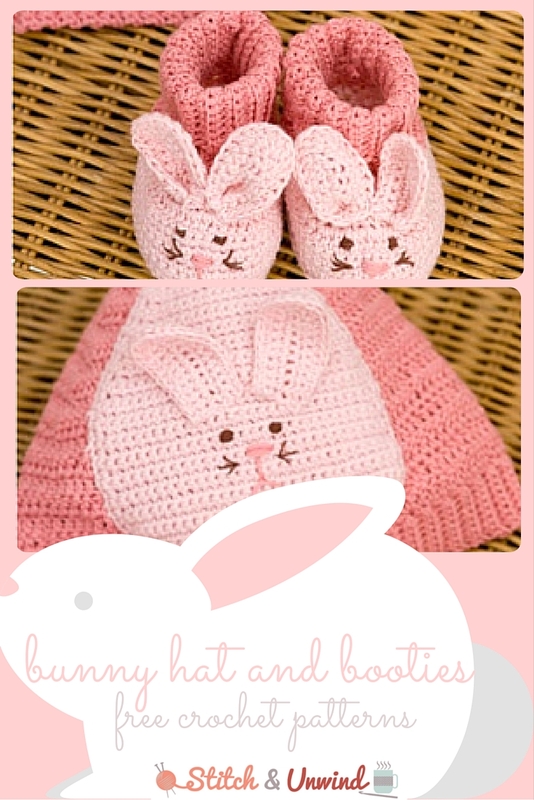 These bunny slippers and hat are adorable, I am currently working on a hat & booties for my grand baby when I finish I will probably take a stab at these, for her or another grand Thanks for the pattern. Thank you for the pattern. I’m going to make it for my granddaughter!